Did you know that the hardware store is one of the best places to shop for creative projects? 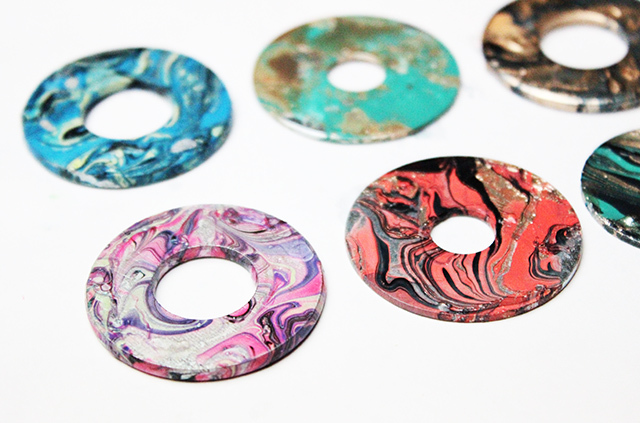 And at about twenty-five cents, washers are one of my favorite materials grab when I am browsing the aisles of my local Home Depot. 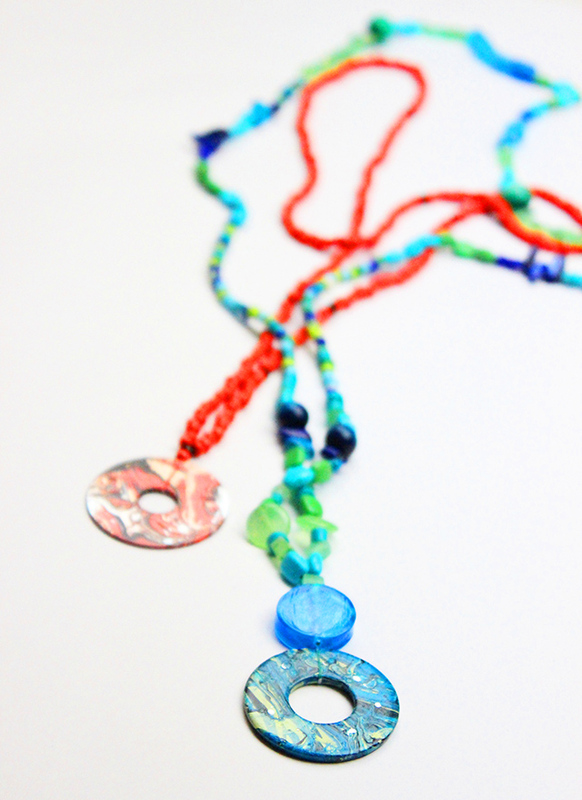 There are so many different ways to transform a washer into a pendent. 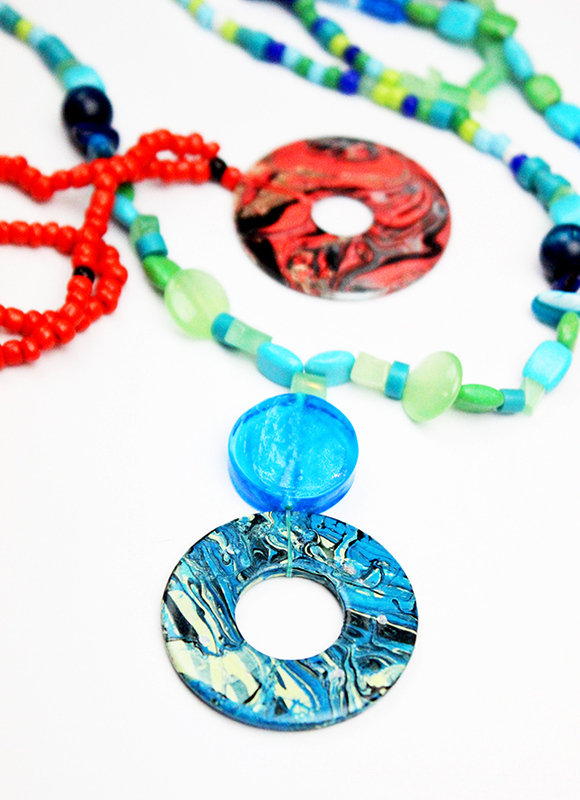 I thought it would be fun to use nail polish marbling to create some colorful statement necklaces. 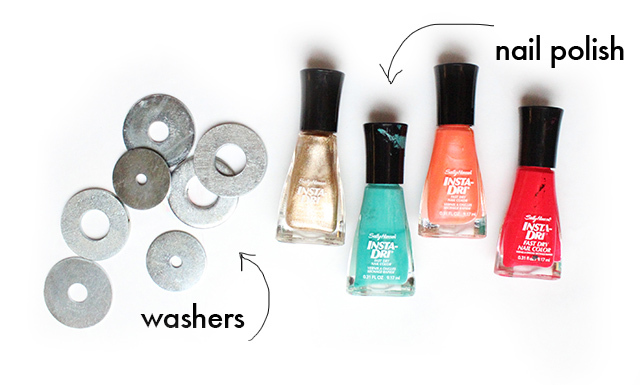 All you need are washers and nail polish. 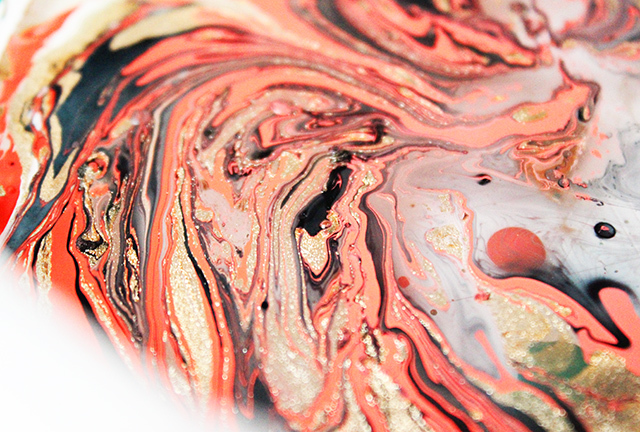 Fill a small container with water and lightly pour the polish onto the surface of the water and then swirl it around. Next, dip the washer into the the water. It will pick the marbled nail polish and once dry will be permanent. 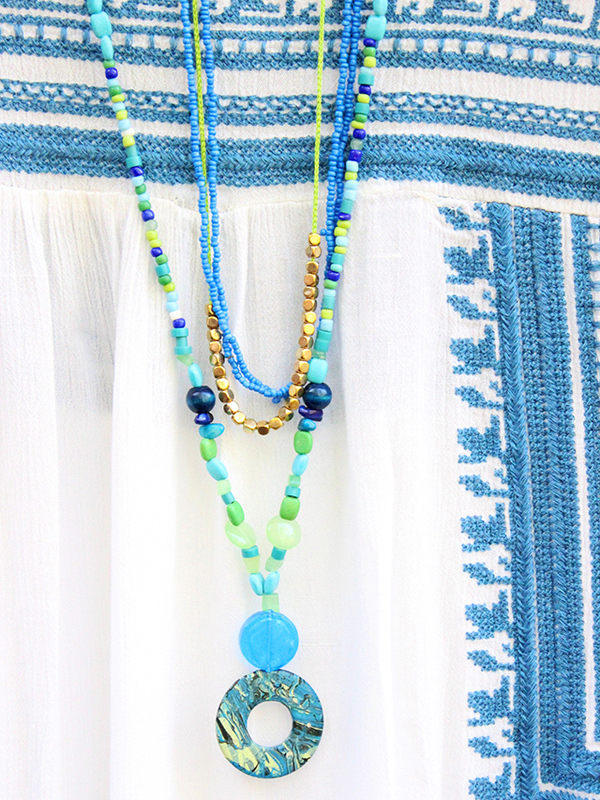 I used colorful beads and created a long strand necklace with the washer as the pendent or you could add the washer to your favorite chain or strand of beads. the nail polish sticks to the washer ok and doesn't flake off? i have painted a ring in the past with nail polish and it would constantly chip away and i would have to repaint it. i supposed the necklace wouldn't because it hangs in a place that doesn't get beat up. that would make sense. what to you put it on to dry? does this cover both sides of the washer? Britt, in my experience nail polish dries permanent. I've tried to peel it off and beat it up but nothing comes off of the projects I create with nail polish. Perhaps different polish works in different ways? If you dip the washer far enough into the water it will cover both sides. For drying I just slip a paintbrush into the hole and suspend it so the washer is not touching anything. I am using quick dry nail polish and it takes minutes to dry. Great project idea! 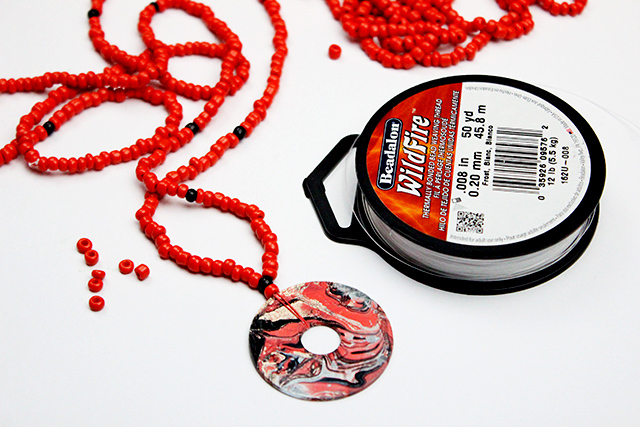 You could do earring this way with small washers too. Thanks. I can't wait to try this! I think there is a product called diamond glaze (or gloss glaze) that adds a clear thick tough topcoat layer. 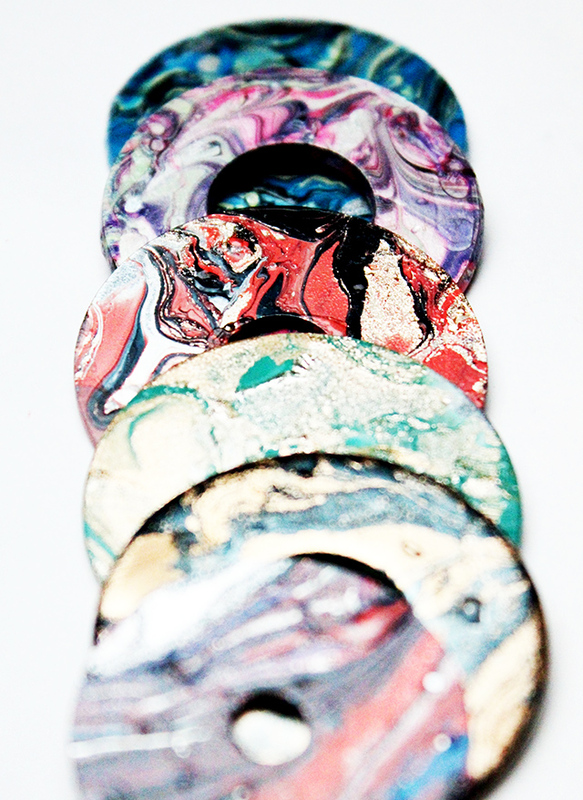 I don't know if it causes ink to bleed - but if not, your designs, cut into paper donuts, on top of washers with shiny top coat would be stunning! Hi! I tried this but the polish hardened as soon as it touched the water. 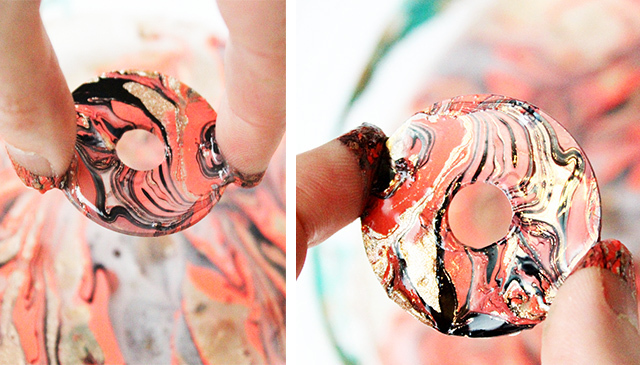 So it was impossible to swirl, and when I dipped the washer in the polish was like a solid-ish sheet of plastic. Any ideas on what might be going wrong? How do you dispose of the polish/water? Super.cool.- I can't wait to try this! it did not work for me, not sure if that is due to the quality or oil content of my nail polish.